Unfortunately, boating accidents are all too common across Florida. This can be a frightening and overwhelming experience, particularly because boating accidents have their own unique concerns and it is important to protect yourself and get medical attention sooner rather than later. What follows are some of the most important tips you need to keep in mind after you have been injured in a boating accident. The steps you take after a boating crash or other incident could help to save your life and to protect your legal rights. Even if you suspect that you have not been seriously injured, it is important to get medical attention for your injuries. Some of the most devastating injuries that can occur after a boating accident may not be immediately visible. This is why you need to have a doctor evaluate you carefully to determine whether or not further testing is required. If everyone on the vessel is still on the boat, the main priority should be to keep the vessel out of harm’s way while giving medical assistance to those on board. In the event that someone has fallen off of the boat it is essential to throw them a life jacket or other floating ring to keep them above water. According to studies from the U.S. Coast Guard, 70% of boating accident fatalities are a direct result of drowning. The coast guard should always be notified that an accident has happened and whether or not any medical assistance is necessary. Make sure to inform them of the location of the accident. While it is certainly true that you should never leave the scene of the accident if someone is in need of medical attention, it is a good idea to stay there until the coast guard has arrived anyway just to protect yourself. Identification numbers or registration numbers for the vessels involved in the accident. There is a complete loss of the vessel or the vessel is otherwise destroyed. Someone disappears from a vessel in situations that indicate serious injury or death. Someone is injured severely enough to require medical care outside of traditional basic first aid. Damage to the property or the vessel meets or exceeds $2000. After the accident has concluded and you have been able to get medical attention for your injuries, it is important to figure out whether or not there is a legal claim against the boating operator or another third party. The only way to know this for sure is to hold off on making any settlement agreements with the insurance company and to meet with your own Florida personal injury attorney. An injury attorney should have a background in working with clients who have been through boating accidents like this before. Your attorney can make a big difference on the outcome of your case so you need to contact an experienced attorney like those at the Leifer Law Firm to represent you in this challenging and overwhelming situation. 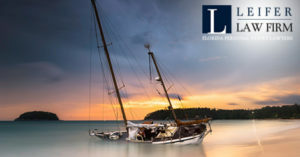 Unfortunately, while boats can be used for good and safe fun across the state of Florida, all too often boating accidents can leave a victim with severe injuries from which the person may never fully recover. Thankfully, you have legal rights under Florida’s personal injury laws. Contacting an experienced attorney can help you figure out your next steps.